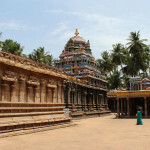 Timings: 7.00 a.m. to 12.00 a.m. and 4.00 p.m. to 8.00 p.m.
Thirumohoor Kalamegaperumal Temple is one of the “108 divya desams”,and is also known as Mohanapuram and Mohanakshetram.The temple has 5 tier rajagopuram.There are four prakarams and the main deity.The Sudarshana Chakra of deity is famous. Nammazhvar and Thirumangaiazhvar have sung the mangalaasaasanams for the deity here. An interesting feature is that adishesan has thanga kavacham and this form of the Lord was prior to the Lord taking Mohini avatharam.The specialty of the temple is the presence of Chakratalwar with 16 hands and each hand holding a different weapon. There is Lord Narasimha behind chakratalwar with shanku chakra. There are 154 alphabets carved in the 6 circles and there are pictures of 48 gods. The place got its name as moghur due to the Mohini avatharam taken by Lord Vishnu. It is believed that a drop of amrutham fell into the temple tank and hence it is also known as periya thirupaarkadal and siriya thirupaarkadal.